Just imagine it! Waking up to the sound of sea and surf pounding the sand right outside your very own home. You don’t have to call ahead for reservations, you don’t need to ask anyone for a key or have a check-out time. It’s all yours to do with as you will, and you’re going take advantage of it constantly because now you own your very own vacation home. Not to burst any vacation home-shaped bubbles, but before you get too lost in the fantasy, you need to consider some of the many pros and cons of owning a home away from home. As the real estate market begins to respond to financial pressures from higher interest rates that are only set to increase further, as well as trade wars and tariffs with some of the country’s best trading partners, more people are just waiting for their favorite vacation spot to experience a market correction. If you’re one of them, don’t jump into the vacation home market without seriously considering what you’re doing. 1. What can you afford on your own? It’s no secret that many vacation homes will go for several times what your personal home may be worth. Because of this, buyers like to try to pool their assets to pull off a vacation home purchase with friends or family. Don’t let your vacation home become a cautionary tale: buying a vacation home with anyone that you’re not married to could become a long term problem. What if you and the friend or relative don’t like the same beach? What if you can’t agree on the property to purchase? Will you be resentful the rest of your life? Most importantly, perhaps, is what to do if your co-borrower has poor credit, can’t come up with their part of the downpayment or is otherwise creating a giant problem for your mortgage? After you’ve actually bought the property, who pays for what repairs? Don’t buy with friends or family, but if you do, get a lawyer to draw up a maintenance and payment agreement that you both sign to get everything on paper and make it official. 2. Even if you do buy a vacation home on your own, it will be complicated. This isn’t your momma’s FHA loan. When you buy a vacation home, you’re almost always going to use a conventional mortgage. You’ll need stellar credit, an excellent debt to income ratio and, most importantly, a lot of cash. Unlike primary homes, which rarely require reserves, being the lender on a secondary home feels awfully risky to the bank. They may still lend to you, but they’ll want to see that you have anywhere from two to 12 months of reserves on hand. If you’ve not heard the term before, “reserves” are funds already in an account somewhere that are equal to a certain number of months’ worth of payments for both of your homes. This also includes anything wrapped into your payment due to escrow, like homeowners’ insurance and taxes. 3. Do you have a plan for off-season care and maintenance? If a friend or relative lives nearby, you probably are set for someone to look in on your place, but if not, you’ve got to get this part figured out before you sign on the line. Just like an occupied home, your vacation home will develop problems over time. Wear and tear happens even when you’re not home and pipes love to freeze and burst when no one’s looking. You have to have a plan. You should hire a handyman, property manager or other real estate expert to keep an eye out and call in help when necessary. That’s a cost you’ll have all year, so make sure you figure it into your budget. Since your property is a vacation home, it will also require more expensive insurance coverage, as well as specialty insurance if it’s in an area where floods, hurricanes or earthquakes are common. 4. Renting it out when you’re not using it makes your vacation home a rental, not a vacation home. You absolutely can rent your vacation home from day one, provided that you purchased it as an investment home. Some buyers think this will save them a bunch of money, since someone else will take care of it part of the year, at least. The truth, as usual, lies somewhere in between a glorious rental partnership and a home that’s been burned to the ground. If your neighborhood, for example, won’t allow AirBnBs and their ilk, or has strict rules about maintenance, you are responsible for the rebound from missteps there, no matter how good your renters. You will have to find the guy to mow the lawn, you’re paying for clean up every time renters move out, you’re paying for repairs and so forth. Did you want to be a long-distance landlord? A property manager can help ease the pain, but it will still cost plenty. If you do decide to proceed with a rental situation for your vacation home, make sure the house you buy is in a location that’s really hot, otherwise you may not be able to get enough rent to cover all the expenses. 5. Oh, hey, and selling can be difficult and costly. For every one of the real estate experts who claim that buying a vacation home is a great way to make money, there are experts who realize that the market is unpredictable and you may find that you don’t love that vacation home as much as you thought in a few years. After spending two years dealing with short term renters, you may decide it’s easier for you to go back to renting a nice hotel for your vacation stay, rather than owning a headache of a property. That’s all fine and good, until you find out that not only has the market bottomed out, you can’t even get enough money out of the place to cover the mortgage and your closing costs. Remember, when you sell, you may also be on the hook for capital gains taxes, and you can’t take a capital loss if the property in question is classified as a second home. 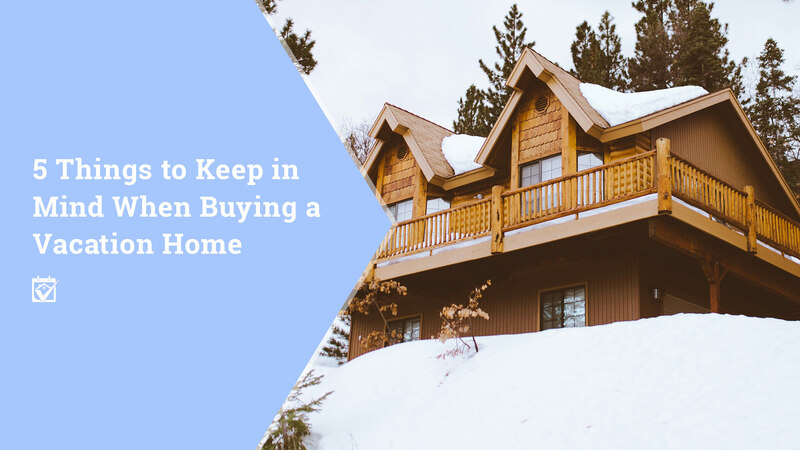 If you still have the stomach for a second home after running through this list of things to consider, then proceed with caution. Don’t buy a project house unless you have someone else to do the work and even then, make sure that the only thing you do at that vacation home is relax. Going on vacation just to stress out about the lawn isn’t a fun kind of vacation, you know? Wondering where you’ll find all the people you need to help keep your vacation home in good shape, whether you’re renting it out or just visiting on the weekends? Ask your HomeKeepr family! A quick click and the community can recommend home pros in the area, from the best handyman around to a property manager who can keep your renters in line.